This comprehensive 203 page e-Book covers litigation strategy, predicting litigation outcomes, and estimating the financial value and risk of continuing a lawsuit to a final judgment. Develop a strategy that achieves the Best Outcome Possible, whether through litigating to final judgment or with a voluntary settlement. 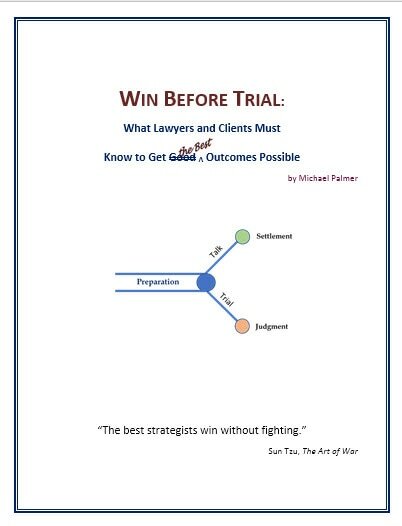 This book helps legal risk managers--both clients and lawyers--resolve legal disputes wisely and cost-effectively. The book is free as part of The Mediator's Assistant package. ($25 as stand alone product.) Offer available for a limited time only. Download the first 2 chapters for free. Part of the legal dispute prevention side of legal risk management, this book introduces and guides you through the ethics mandates of the Federal Acquisition Regulation. A must for anyone working in federal government contracting. Know what rules apply to you and what your organization must do to stay in compliance when making deals with the government. Download the first chapter and Introduction to get a preview.